Lee Valley Regional Park Authority is investing £500,000 to create a new Bittern Information Point and bird hide at Fishers Green, near Waltham Abbey, Essex. The new Bittern Information Point will replace the current hide, which was first built over 30 years ago, overlooking Seventy Acres Lake, one of the best places in the country to see wintering Eurasian Bittern and home to a gull and tern colony during the summer. From spring 2020 visitors will be able to enjoy state-of-the-art facilities including a brand-new viewing tower, providing a completely different perspective to watch wildlife and a two-tier viewing platform inside the hide for enhanced viewing angles and photographic opportunities. A CCTV system will provide stunning close-up footage, along with new nest box cameras, allowing visitors to get closer than ever to the wildlife in this signature spot in the Lee Valley. Eurasian Bittern is a flagship species of the Lee Valley, and it's hoped that the new project will give a unique insight into the secretive birds' lives (Mark Braun). The Bittern Information Point project will also include significant habitat improvement work, including building a bank for Common Kingfishers and further enhancing the reedbed habitat for Eurasian Bittern, a key species for the Lee Valley. Work will commence over the next few weeks to allow more light into the reedbed by the removal of selected trees, helping the reedbed to grow and flourish. This builds on the extensive work which has already been done within Lee Valley Regional Park to create and enhance a network of reedbeds. Several bitterns return to Lee Valley Regional Park each year to over-winter. It is hoped that continued efforts in the park will eventually lead to them staying in the valley throughout the year and successfully breeding. Commenting on the exciting new project, Shaun Dawson, Chief Executive of Lee Valley Regional Park Authority, said: "We are delighted to be able to make such a significant investment into improving this signature spot in the Lee Valley. 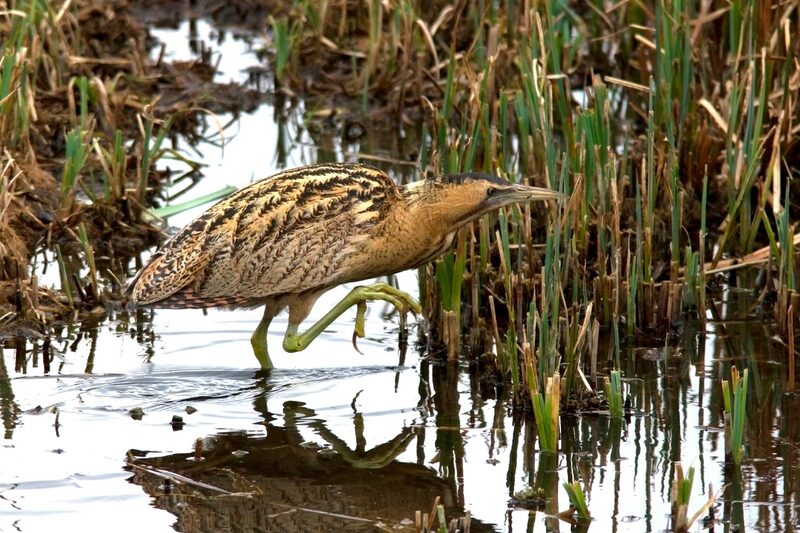 The new facility will provide visitors with greater access to, and understanding of, one of our key Biodiversity Action Plan species, [Eurasian] bittern, and opportunities to get up close to a range of wildlife. The information point will benefit all visitors and provide a focal point on the east of the River Lee Country Park. We look forward to welcoming visitors in spring 2020." As part of the plans, a bank will also be installed to encourage breeding Common Kingfishers (Lee Fuller). The Bittern Information Point will continue to be staffed at weekends and bank holidays by a team of volunteers, who are on hand to help visitors with sightings and information. The Authority is also hoping to extend this on-site support into the week. In order to open up light levels and enhance the reedbed habitat a small number of trees will be removed in February 2019. This work has been carefully timed to ensure there is no disruption during the bird breeding season and any bitterns present will be carefully monitored to ensure no disturbance. The bulk of the building work will then be carried out during spring 2020. The Bittern Information Point is at the heart of the 1,000-acre River Lee Country Park, an excellent place to spend time watching wildlife. A network of surfaced paths wend their way round a mosaic of flooded gravel pits, wader scrapes, wet woodland, rivers, grassland and scrub. There's a wealth of wildlife throughout the year from Water Vole and Otter to dragonflies, bittern, and wintering wildfowl such as Gadwall and Northern Shoveler. River Lee Country Park is just one of the award-winning open spaces within the 10,000-acre, 26-mile long Lee Valley Regional Park. For the latest news and events taking place in the park visit www.visitleevalley.org.uk.